The cold-weather cycling season is upon us, which means that it’s essential to develop a warm, comfortable clothing system for your face, head, and ears. Here are some tips for warmer winter riding based on my years of riding through the coldest season. First, start keeping tabs on the exact temperature outside so that you can develop and fine-tune your clothing system. For me, what I wear on my head and face depends on roughly 10-degree increments. As I make my final preparations for riding and start donning headgear, I check the outside temp. Here’s how my personal algorithm works. I add a lightweight fleece hat to my clothing system once temps hit the mid-40s and below. Finding a hat that works for winter riding is always a challenge and I covet those I find that work for this application. Specifically, it needs to be thin enough to fit comfortably under the helmet and extend down far enough to fully cover your ears, which cause the greatest discomfort if they get nipped by the forward wind you generate while riding. I find that regular fleece provides sufficient warmth and protection for me at these temperatures, even though it doesn’t block much wind. I like the soft comfort, plus the increased breathability of regular fleece is a plus once I start heating up. You may also consider a “skull cap,” a thin, snug, form-fitting hat often designed specifically for cycling. Personally, I dislike the tight fit, plus have found it difficult to find styles that fully, and comfortably, cover my ears. Alternatively, some folks wear just a warm headband to cover the ears at these cooler temps, though I find these difficult to fit under a helmet and tend to shift around and slide downward as I ride. I have been intrigued lately, however, by the concept of the Helmuff, small fleece covers just for your ears that fit over the helmet straps. I ditch the fleece hat and instead wear a lightweight, windproof balaclava that protects my head, ears, neck, chin, and mouth, yet still leaves my nose exposed. 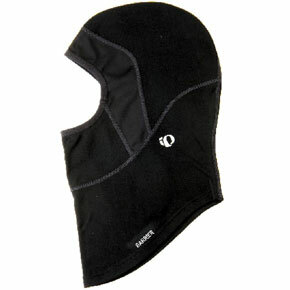 I recently began riding with the Pearl Izumi Barrier balaclava ($35), which has been performing admirably. Even though it is thinner than a fleece hat, the wind resistance—plus the additional coverage—actually makes it a warmer garment. I like that my nose remains uncovered, since the cold weather inevitably makes my nose start running sometime around mile 5 and I often make several “farmer’s blows” over the course of my ride to clear out the sniffles. 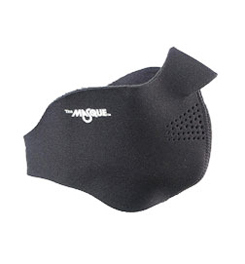 It’s possible to pull up this particular balaclava over your nose for short periods, but it doesn’t stay in place for long before slipping back down. I replace the balaclava with a lightweight wind-resistant fleece hat and neoprene facemask. Once temps hit the low 20s, I find that my nose begins to get uncomfortably chilled and that the benefits of protecting it outweigh the hassle of a runny nose. I dislike the feel and noise-muffling characteristics of fully windproof fleece hats (they also greatly reduce breathability and can lead to a very sweaty head as you warm up), so my current hat of choice is made from Polartec WindPro, a still-soft yet wind resistant fabric. For years, my face mask of choice has been the Seirus Masque ($15). Made of fleece-lined neoprene, it fits comfortably, snugly, stays in place, and does not affect the fit of my helmet. As temps descend into the low teens and single digits, the chilly air begins to make my eyes water uncomfortably and can start to affect my vision. To mitigate this, I add a pair of sunglasses, usually with a pair of clear lenses since much of my winter riding is in low-light or dark conditions. By blocking the wind, they protect my eyes and vision and also help keep the skin around my eyes from becoming uncomfortably chilled. You could also add a wind-proof helmet cover to add another defense layer against the wind, as well as some potential extra visibility (many are available with reflective strips and/or in bright colors). I’ve not yet tried these out, however.